← Who sells whose wine? At the start of 2011 I resolved to spend my wine budget more freely, rather than getting overexcited in the Waitrose sale, snaffling a couple of cases from the Wine Society somewhere along the line and not really having much time, space or money left for anything else. And I succeeded spectacularly well, placing my first orders with a good half-dozen merchants, and even dipping my toe into the world of auctions. In many ways I succeeded much too well, and much too often, so as a result this year’s resolution is to scale back a bit, and to make sure my wine fridge never overflows. Promisingly, I’ve already let a couple of new year sales pass me by, and for my first wine purchase of the new year I went back to a familiar source. For some time I’ve seen the Wine Society occasionally offer “mystery” mixed cases of wine without ever being seriously tempted, but this year I had a change of heart. The worst that could possibly happen, I decided, is that I feel ripped off and get myself a furious blogpost with which to start 2012, which wouldn’t be so bad. 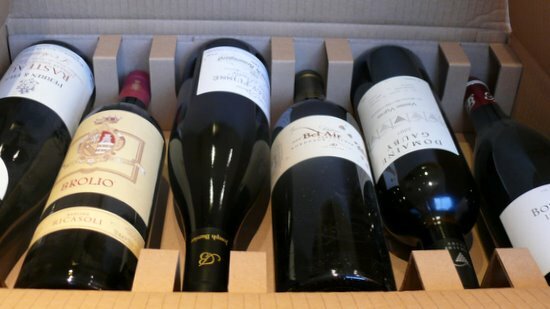 So I spent £79 on six mysterious “fine wines”, the cheapest of their secret cases (which go up to £220 for six clarets), which was to contain four reds and two whites, comprised of a Claret, a Rhône and a white Burgundy plus either a red Burgundy or a Beaujolais, a white and a premium non-French red. I was promised a saving of £15. Pouilly-Fuisse “Vers Puilly”, Chateau de Beauregard 2009 (Which I can’t find anywhere else, though James Nicholson have their “Vers Cras” cuvee for £26.99). Those retail prices add up to £109.72, which makes my saving considerably higher than advertised (almost exactly double the £15 they promised, in fact). Of course, the downside of this kind of case is that you end up with wines you wouldn’t necessarily have chosen yourself, but I find that (subject to certain minimum standards being met) I enjoy wines I probably wouldn’t ordinarily have bought myself (but did anyway) at least as much as those I would. In this case, the Bordeaux and the two Burgundies stand out as the wines least likely to have found their way into my house any other way. If I have a complaint with my case it’s that they could have thrown in a wine from the new world, or more from places that aren’t France. If you push me for a second, it’s that the Wine Society seem mildly obsessed with flogging me Chianti Classico, having already sold me six bottles of Brolio’s 2007 (and a couple of others) through a Vintage Cellar Plan (another way for them to decide what wines they sell you) I share with a couple of friends. When I was a child they used to sell grab bags. They would alwas have at least one thing in the bag that made the thrill worth the money. I got a veriety 6 pack of beer for Christmas. I liked 3 and had to pour 3 out. I think maybe its a way for the retailers to get rid of the stuff that is’nt moving well. I still think you made a wise choice, as veriety is the spice of life. I’m sure it’s a way for retailers to get rid of stuff that hasn’t shifted. I’m under no illusions about that. But I’ve tried plenty of unpopular but delicious wines, there’s no crime in unpopularity. If you trust a retailer not to stock overpriced rubbish (and none of these wines are exactly cheap), you should be happy that even the wines they’ve struggled to sell could be perfectly good or better. I wouldn’t buy a mystery case from any other major retailer (but I can think of plenty of smaller ones who have earned my trust).